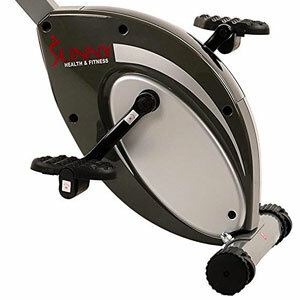 The Sunny XL SF-B2721 is one of the exercise bikes released by Sunny Health & Fitness at the beginning of 2018. It’s quite similar to the Exerpeutic Gold 500 XLS, however, as opposed to the Exerpeutic model, its seat features a backrest. 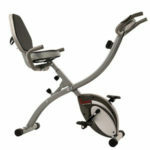 Therefore, this is a semi-recumbent bike designed to provide more comfort. It’s also an affordable one, currently available for less than $200. The Sunny Health & Fitness SF-B2721 features a steel frame, composed of two main parts connected at the middle. All the steel parts in its construction are coated with a corrosion-resistant paint. The color used is gray, this being the only color available for this unit. The fully assembled unit isn’t extremely large. The frame actually has three lock-up positions, which offer three different height levels for the seat and handlebars. With the frame locked at its lowest position, the bike is at its longest setting, being 32″ (81 cm) and 21″ (53 cm) wide. Conversely, with the frame locked in its highest position, the length of the frame is reduced to 24″ (61 cm), but the height of the unit will reach 49″ (124 cm). The bike’s frame can also be completely folded up, similar to the BCP SKY2380 bike. With the frame fully folded, its dimensions are: 18″L X 21″W X 54″H (46 x 53 x 137 cm). This being said, the bike can easily fit in small places for storage. Evidently, since it’s an exercise bike designed for light cardio workouts, it is far from being heavy. With all the parts assembled, it weighs approx. 38.5 lbs (17.4 kg). This being said, it’s easy to carry and handle. But nonetheless, its front base bar features transport rollers which facilitate its relocation. As we’ve mentioned above, this Sunny exercise bike has three frame locking settings which place the bar that sustains the seat at three different incline positions. However, the seat post itself also has 4 adjustment notches. Therefore, the bike can accommodate users between 4’10” (147 cm) and 5’8″ (172 cm). Taller users will not benefit from a complete leg extension. Also, the seat assembly, along with the whole frame construction, can support users up to 300 lbs (136 kg). The bike’s seat is designed for superior comfort. Both the seat and its backrest feature a 2.5″ (~6 cm) thick layer of foam padding, with a breathable upholstery. The seat itself is 14″ (35.5 cm) wide and 10.5″ (26.6 cm) long, offering plenty of contact surface. In case you’re wondering, the backrest does not adjust independently from the seat. It is directly attached to the metallic backbone of the seat. It’s pretty sturdy, providing an excellent lumbar support. The seat height, as well as the frame incline, are adjusted via two knobs. The adjustment can be done easily, in under a minute. However, the bike cannot be adjusted while you are riding it. The Sunny Comfort XL SF-B2721 features two sets of handlebars. One is directly attached to the seat, the other is attached to the front part of the frame. They are non-adjustable; they both feature rubberized grips for better hand adherence and comfort. Also, the front handlebars integrate contact pulse sensors. 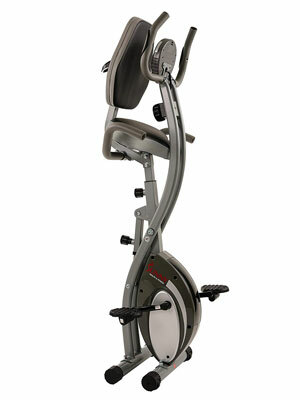 The Sunny Comfort XL semi-recumbent bike integrates a magnetic resistance system with manual action. It has an internal magnetic brake which is attached to the tension knob on the main frame part. When you turn the knob clockwise, the brake moves closer to the flywheel, generating more resistance. Since the resistance system is manual, the bike does not require a power source. Also, its console does not play any role for the resistance adjustment. 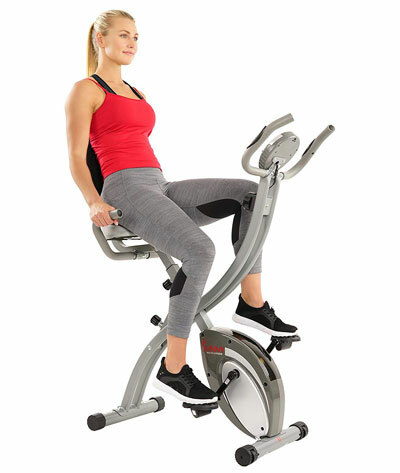 As opposed to various other upright or recumbent bikes with a manual magnetic resistance system, such as the Exerpeutic 1000, or the Marcy NS-1201U for example, this Sunny exercise bike offers 10 distinct resistance levels. The first 3 levels are fairly light, great for recovery training. However, the 8-10 levels deliver quite an impressive pedaling difficulty for a light-capacity bike, simulating a steep climb. The bike is equipped with a 3.3 lbs (1.5 kg) flywheel which is perimeter-weighted, in order to provide a more consistent momentum and a steady pedaling feel. Although it’s not a heavy flywheel, the bike still provides enough resistance or pedaling difficulty, especially on its highest levels, simply because it integrates an intermediary pulley. This not only that adds difficulty, but it also adds more smoothness to the ride. Like most exercise bikes with a magnetic resistance, this one has a belt drive, using two internal belts, one that connects the intermediary pulley to the flywheel, the other that connects the pedal pulley to the intermediary pulley. Both belts are made of rubber material; they’re standard 240J3 and 230J3 V-belts, which should last for many years of use. The bike’s crankset is fairly durable, featuring steel crank arms. However, it’s not durable enough to support pedaling while standing up on the pedals. Not only that, pedaling while standing up would also lead to a very awkward posture due to the bike’s construction. The included pedals are made of a heavy-duty plastic material with an internal metallic core. They’re also weighted, and have adjustable straps so that you can perfectly secure your feet on them. 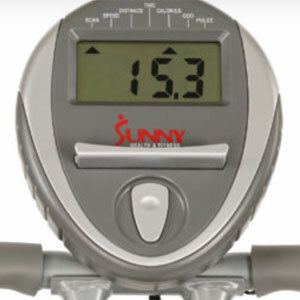 This Sunny exercise bike is equipped with a basic exercise meter. It features an LCD display which indicates the most important workout metrics, including time, distance, total distance, speed, calories, and pulse. It’s battery powered and requires two AA batteries which are included. It starts when you begin pedaling, and also automatically shuts down after 4 minutes of inactivity on the bike. The meter unit is fairly easy to use. It only has one (MODE) button, which allows you to select any of the values to be shown on the display, or select the SCAN mode which rotates all the values, showing each one for 5 seconds. The MODE button also has a reset function; if you press and hold it for a few seconds, it sets all the values on the meter to zero. Evidently, the meter unit is not telemetric. It cannot read your pulse through a wireless HR transmitter. Therefore, in order to benefit from a pulse reading, you have to hold on to the contact pulse sensors integrated into the front handlebars. In terms of accessories, the bike is equipped with a small media holder and a bottle holder. The media holder is actually integrated into the meter unit. It consists of a small shelf which can provide support for your phone or tablet during exercises. The bottle holder is attached to the backrest. It’s a rather strange placement for a bottle holder, as the access to it is a bit difficult from the seated position. But nonetheless, you can still have your hydration bottle with your bike at all time. The two main pieces of the frame are already connected together in the middle. Also, the drive and resistance elements come already attached to the front part of the frame and covered by the ABS shrouds. Therefore, in terms of assembly, you only have to add the bike’s bases, the seat post, the seat, the backrest, the two sets of handlebars, the console, and the pedals. This task shouldn’t take more than an hour. All the necessary tools for assembly are included, and the provided owner’s manual offers excellent assembly instructions. Maintenance doesn’t require much. It’s recommended to keep the unit clean and periodically check for loose bolts and parts. The internal parts do not require any lubrication. The display of the meter does not have backlight. The Sunny Health & Fitness Comfort XL SF-B2721 is a semi-recumbent bike designed for home use and light cardio workouts. 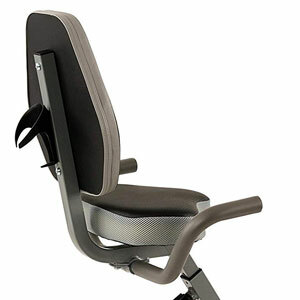 It features a 3-position frame and four adjustment positions for the seat. It has a foldable frame, easy to handle and store away. It’s equipped with a manual magnetic resistance system with 10 levels, and also includes a fitness meter. And finally, it’s an affordable bike, offering an excellent value for the price.